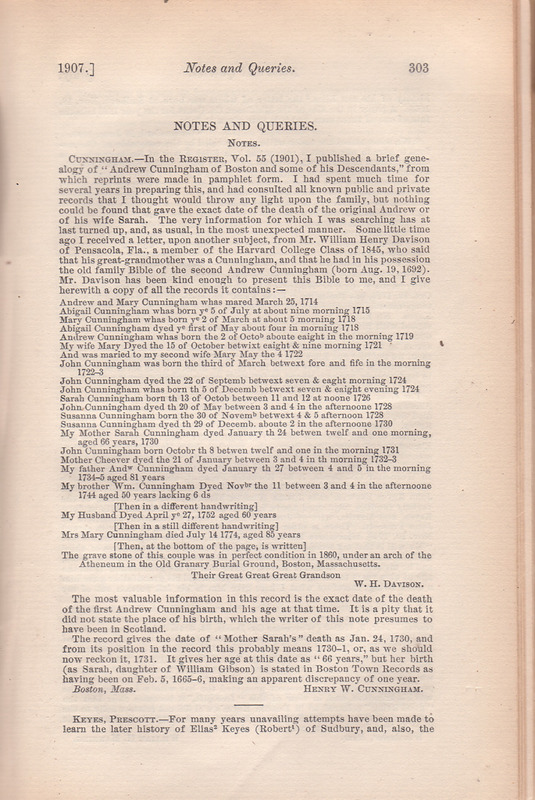 This Bible record was transcribed from the New England Historical and Genealogical Register, July, 1907, Volume LXI, page 303. Transcribed by Tracy St. Claire, tasaint@comcast.net . Below this line, verbatim from source, with some formatting changes. The grave stone of this couple was in perfect condition in 1860, under an arch of the Atheneum in the Old Granary Burial Ground, Boston, Massachusetts. The most valuable information in this record is the exact date of the death of the first Andrew Cunningham and his age at that time. It is a pity that it did not state the place of his birth, which the writer of this note presumes to have been in Scotland. The record gives the date of "Mother Sarah's" death as Jan. 24, 1730, and from its position in the record this probably means 1730-1, or, as we should now reckon it, 1731. It gives her age at this date as "66 years," but her birth (as Sarah, daughter of William Gibson) is stated in Boston Town Records as having been on Feb. 5, 1665-6, making an apparent discrepancy of one year.